Customs duty is a kind of indirect tax which is levied on goods of international trade. Duties levied in relation to imported goods are referred to as import duty and duties levied on the export goods are called export duty. The ancient "custom" of gifting a part of his merchandise by a merchant to the King while entering a kingdom came to be formalized by the modern States into customs duty. Customs duty is imposed on the goods imported into or exported out of the country. Developing economies including India use customs duties as an important source of revenue and also a method to regulate the flow of goods. The Central Board of Indirect Taxes and Customs (CBIC) is the apex body for customs administration. Central Board of Indirect Taxes and Customs (CBIC) is a part of the Department of Revenue under the Ministry of Finance, Government of India. CBIC deals with the task of formulation of policy concerning levy and collection of customs duties. The Board discharges the various tasks assigned to it, with the help of its field formations namely the Customs, Customs (Preventive) and Central Goods and Services Tax Zones, Commissionerates of Customs, Commissionerates of Customs (Preventive), Commissionerates of Central Goods and Services Taxes, Central Revenues Control Laboratory and Directorates. There are 11 zones of Customs and Customs (Preventive) and 21 Central Goods and Services Tax Zones spread across the country. These zones are headed by the Principal Chief Commissioners/ Chief Commissioners. There are 57 Commissionerates exclusively of Customs, Customs (Preventive) and Customs (Appeals), 205 Commissionerates of Central Goods and Services Tax, Central Goods and Services Tax (Audit) and Central Goods and Services Tax (Appeals) headed by Principal Commissioners/ Commissioners. Calculation of Customs duty depends on the determination of assessable value in case of items for which the duty is levied ad valorem. The assessable value is often the transaction value or the value assessed in accordance with Brussels definition. 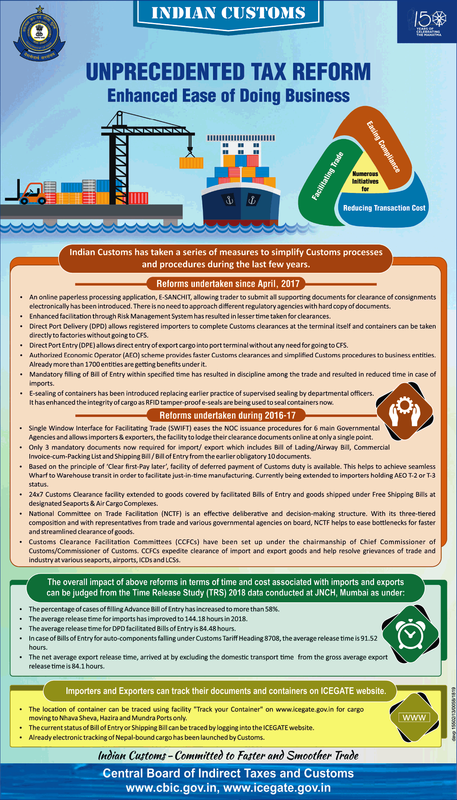 India is an active member of the World Customs Organisation and has adopted various international customs conventions and procedures, including the Harmonised Classification System and the General Agreement on Tariffs and Trade (GATT) based Valuation System. Products are given an identification code known as the Harmonized System Code for the purpose of assessment of Customs duty. This code has been evolved and assigned by the World Customs Organization based in Brussels. Introduction of HS Code in 1990s has largely replaced the earlier Standard International Trade Classification (SITC), though SITC still remains in use for statistical purposes. In drawing up the national tariff, the revenue departments often specify the rate of Customs duty with reference to the HS Code of the product. In some countries and customs unions, 6-digit HS codes are locally extended to 8 digits or 10 digits for further tariff classification. Thus the European Union uses an 8-digit CN (Combined Nomenclature) and 10-digit TARIC codes. In India, the Customs Tariff was incorporated as Schedules to the Indian Tariff Act, 1934. The First Schedule to this Act was the Import Tariff and the Second Schedule was the Export Tariff. The Customs Tariff Act, 1975, with the above Schedules, came into effect on 2nd August, 1976. The Import Schedule was based on the Customs Co-operation Council Nomenclature, which was also known as "Brussels Tariff Nomenclature" (BTN). Further, with effect from 28th February, 1986, the above Tariff was revised based on the Harmonised System of Nomenclature (HSN) adopted by the World Customs Organisation (WCO). The Harmonised System Nomenclature (HSN) which is otherwise known as "Harmonised Commodity Description and Coding System" was evolved by the World Customs Organisation and came into effect in the Harmonised System Convention from 01.01.1988, i.e. almost two years later. During the period and until 31st January, 2003, the Tariff consisted of 6 Digit code. The Customs Tariff in India remained a 6 Digit Code aligned with the HSN during the period from 28th February, 1986 to 31st January, 2003. However, the Directorate General of Commercial Intelligence and Statistics (DGCIS) had evolved a 8 Digit Code for compilation of imports/exports data and the Directorate General of Foreign Trade had adopted HSN based 8 Digit Code for the Foreign Trade Policy. Therefore, there had been a demand from the trade and industry for the adoption of a common classification code for all trade related transactions. Accordingly, on the 20th January, 2003 the Government of India promulgated the "Customs Tariff (Amendment) Ordinance, 2003" making changes in the Customs Tariff Act with effect from 1st February, 2003. Thus, the 6 digit code was replaced by the 8 digit classification code. The Ordinance empowered the Government to bring changes in the First Schedule by subordinate legislation and also to specify standard units of measurements against each Tariff item. The Finance Act, 2006 brought further changes in the First Schedule. The New Schedule is in force with effect from 1st January, 2007. In India, customs duties are levied on the goods at the rates specified in the Schedules to the Customs Tariff Act, 1975. The taxable event is import of goods into India or its export out of India. Export duties as specified in the Second Schedule are levied on a very few items only. But import duties are levied universally, barring a few items such as food grains, fertilizers, life saving drugs and equipments, etc. This duty is levied on imported goods in terms of section 12 of the Customs Act, 1962, at the rates prescribed under the First Schedule to the Customs Tariff Act, 1975 in terms of section 2 of the Customs Tariff Act. The rates are either standard rates or in the case of imports from certain specified countries at preferential rates. This duty, commonly referred to as countervailing duty (CVD), is levied on imported goods in terms of section 3 of the Customs Tariff Act, 1975 and is equal to the Central Excise duty leviable on the like goods if produced or manufactured in India. In cases where like article is not so produced or manufactured in India, this duty will be at such rate which is leviable on the class or description of articles to which the imported article belongs. If there is more than one rate of excise duty, then the rate to be applied will be the highest. This duty is calculated on a value base of aggregate of value of the goods including landing charges and basic customs duty. Other duties such as anti-dumping duty, safeguard duty, additional customs duty of 4% etc. are not taken into account. Except tobacco; manufactured tobacco substitutes; mineral fuels, mineral oils and products of their distillation; bituminous substances; mineral waxes, this duty has been subsumed in the IGST after the introduction of GST w.e.f. 01-07-2017. In the case of goods covered by provisions of the Standards of Weights and Measures Act, 1976, the value base would be the retail sale price declared on the package of the goods less the rebate as notified under section 4A of the Central Excise Act, 1944 for such goods. From 01.03.2001, packaged consumer goods are being charged to this duty on the basis of their Maximum Retail Price (MRP) in India and are also required to conform to Bureau of Indian Standards (BIS) quality standards and MRP labeling. This practice has been discontinued after the introduction of GST w.e.f. 01-07-2017. In the case of alcoholic liquors, the additional duty at present is chargeable at a uniform rate as specified by the Central Government irrespective of varying rates in force in the States. A 4% Special Additional Duty (SAD) under section 3(5) of the Customs Tariff Act, 1975 was first imposed in the Union Budget 2005-2006 to counter balance various internal taxes like Sales Tax and Value Added Tax (VAT) and to provide a level playing field to indigenous goods which have to bear these taxes. This was extended in general to all goods in the Budget 2006-2007. Manufacturers will be able to take credit of this additional duty for payment of excise duty on their finished products. In the case of most of the items, this duty has been subsumed in IGST after the introduction of GST w.e.f. 01-07-2017. In the case of imports from certain specified countries at prescribed preferential rates. It is imposed at present @ Rs. 50/- per MT, on imported crude oil and @ 1% on polyester filament yarn, two-wheelers, motor cars and multi-utility vehicles. Anti-dumping duty or Safeguard duty is imposed on import of specified goods with a view to protecting domestic industry from unfair injury. It would not apply to goods imported by a 100% Export Oriented Units (EOU) and units in Free Trade Zone (FTZ) and Special Economic Zone (SEZ). On export of goods, anti-dumping duty is rebatable only by way of a special brand rate of drawback. Safeguard duties do not require the finding of unfair trade practice such as dumping or subsidy on the part of exporting countries but they must not violate the most favoured nation provision, that is, they should not discriminate between imports from different countries. Provisional safeguard duty shall remain in force for a period not exceeding 200 days. Safeguard action is resorted to only if it has been established that a sudden increase in imports has caused or threatens to cause serious injury to the domestic industry. Safeguard action can restrict import of a product for a temporary period by raising the tariffs. In the Budget 2004-2005, an education cess on the customs duties had been levied on items imported into India. It is chargeable @ 2%, on the aggregate of duties of customs (except safeguard duty and anti-dumping duty) leviable on such goods. This came into effect on 9th July, 2004. No credit of this cess will be available. In addition to this, in the Budget 2007-2008, the Central Government again imposed a Secondary and Higher Education Cess on goods specified in the First Schedule to the Customs Tariff Act, 1975, being goods imported into India. The rate of this cess is one per cent, calculated on the aggregate of duties of customs. If the goods are fully exempted from duty or are chargeable to nil rate of duty or are cleared without payment of duty under bond, no cess will be leviable. Imported goods are exempted from these cesses w.e.f. 02-02-2018 as the Finance Bill, 2018 proposed to abolish the same. With effect from 01-07-2018, under the GST regime, Article 269A constitutionally mandates that the supply of goods, or of services, or both in the course of import into the territory of India shall be deemed to be supply of goods, or of services, or both in the course of inter-State trade or commerce for levy of integrated tax. So import of goods or services are treated as deemed inter-State supplies and subjected to Integrated tax. While IGST on import of services would be leviable under the IGST Act, the levy of the IGST on import of goods would be levied under the Customs Act, 1962 read with the Custom Tariff Act, 1975. The importer of services will have to pay tax on reverse charge basis. However, in respect of import of online information and database access or retrieval services (OIDAR) by unregistered, non-taxable recipients, the supplier located outside India shall be responsible for payment of taxes. Either the supplier will have to take registration or will have to appoint a person in India for payment of taxes. Supply of goods or services or both to a Special Economic Zone (SEZ) developer or a unit shall be treated as inter-State supply and shall be subject to levy of integrated tax. Import of goods has been defined in the IGST Act, 2017 as bringing goods into India from a place outside India. All imports shall be deemed as inter-State supplies and accordingly Integrated tax shall be levied in addition to the applicable Custom duties. The IGST Act, 2017 provides that the integrated tax on goods imported into India shall be levied and collected in accordance with the provisions of the Customs Tariff Act, 1975 on the value as determined under the said Act at the point when duties of customs are levied on the said goods under the Customs Act, 1962. The integrated tax on goods shall be in addition to the applicable Basic Customs Duty (BCD) which is levied as per the Customs Tariff Act. The Customs Tariff Act, 1975 has accordingly been amended to provide for levy of integrated tax and the compensation cess on imported goods. Accordingly, goods which are imported into India shall, in addition to the Basic Customs duty, be liable to integrated tax at such rate as is leviable under the IGST Act, 2017 on a similar article on its supply in India. Further, the value of the goods for the purpose of levying integrated tax shall be, assessable value plus Customs Duty levied under the Act, and any other duty chargeable on the said goods under any law for the time being in force as an addition to, and in the same manner as, a duty of customs. Under the GST regime, i.e. w.e.f. 01-07-2018, in addition to IGST, a GST compensation cess, is also levied on certain luxury and demerit goods under the Goods and Services Tax (Compensation to States) Cess Act, 2017. The value of the imported article for the purpose of levying cess shall be, assessable value plus Basic Customs Duty levied under the Act, and any sum chargeable on the goods under any law for the time being, in force as an addition to, and in the same manner as, a duty of customs. The integrated tax paid shall not be added to the value for the purpose of calculating cess. Finance Bill, 2018 while abolishing the Education Cess and Secondary and Higher Education Cess on imported goods w.e.f. 02-02-2018, imposed a Social Welfare Surcharge, at the rate of 10% of the aggregate duties of Customs, on imported goods, to provide for social welfare schemes of the Government. Goods which were hitherto exempted from Education Cesses are exempted from this Surcharge also. In addition, certain specified goods, attract the Surcharge at the rate of 3% of the aggregate duties of customs only. An additional duty of customs, called the Road and Infrastructure Cess, on the specified imported goods for the purpose of financing infrastructure projects has been introduced w.e.f. 02-02-2018. This additional duty of customs is in addition to other duties of customs chargeable on scheduled goods under the Customs Act, 1962 or any other law for the time being in force. How to calculate customs duty payable on the imported goods? Source: Guidance Note for Importers and Exporters issued by the CBIC. CBIC - What is CBIC? ACES - What is ACES? CAAP - What is CAAP? ICEGATE - What is ICEGATE? ICES - What is ICES? NIDB - What is NIDB? ECDB - What is ECDB? RMS - What is RMS? SWIFT - What is SWIFT? eSANCHIT - What is eSANCHIT? GSTN - What is GSTN? Disclaimer | Updated on | All Rights Reserved ©2005-19.